The pediatric short bowel state is most often secondary to congenital anomalies and is a life-changing event that requires close cooperation between diverse medical specialities, the patient, and the family. It is best guided from a specialist center, working on a “hub and spoke” model that provides medical and nurse specialist support to referral hospitals. Long-term care, including home parenteral nutrition, is delivered by the family and the local carers, thereby retaining the “family unit” within their work, school, and social environment. 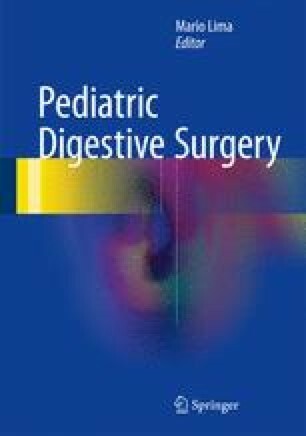 Patient-specific autologous gastrointestinal reconstruction is a structured multistage plan that combines techniques to enhance natural bowel adaptation. Immediate management concentrates on patient and bowel survival, establishing liver-sparing parenteral nutrition and preserving central venous access. Acute surgery emphasizes bowel conservation and is limited to placement of a large-bore jejunal catheter (tube jejunostomy) that overcomes obstruction, avoids intraluminal stasis, and allows immediate full oral feeding. Timed occlusion of the tube jejunostomy forces bowel expansion that generates new full-thickness functional tissue for tailoring and lengthening which, with reversed antiperistaltic segments and drug management (clonidine, GLP-2), increases absorption toward autologous enteral autonomy. Despite its potentially serious complications, transplantation is an attractive final proposition for those with no bowel, with liver failure, with no central vein access, with poor quality life, or who have failed autologous reconstruction. The short bowel state requires a strong belief, determination, and persistence without “cutoff points.” Today’s patient and his carers can truly hope for enteral autonomy and a long life of good quality.